Absorption: In Q4 2016, net absorption was positive for the second straight quarter, totaling 93,566sf. 2016’s total net absorption was positive 655,910sf, with Q2 being the only quarter we saw negative absorption of (41,841sf). Vacancy: Vacancy in Q4 2016 rose to 6.6%, up from 6.1% in Q3. Deliveries: Although we saw a positive net absorption of 93,566sf, vacancies rose due to 2 new buildings being delivered at a total of 355,098 sf. $35.30 in Q3 to $34.90 in Q4, a 1.13% decrease. 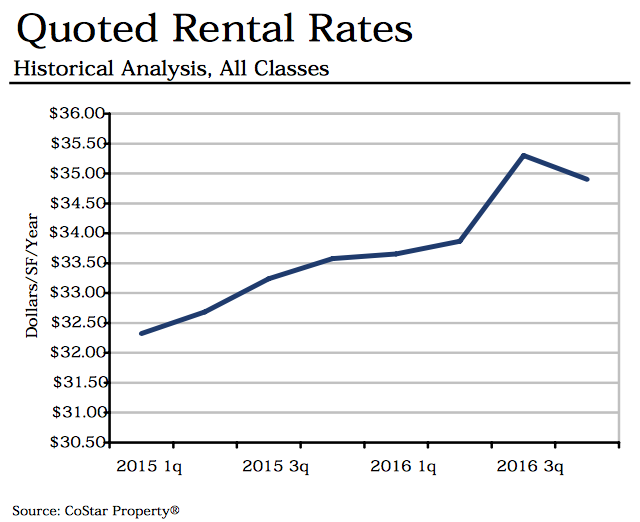 This is the first decrease in rental rates since Q1 2015. Amazon.com, Inc. leased 352,009sf at Centre 425. The Pokémon Company leased 102,112sf at 400 Lincoln Square. WeWork leased 81,497sf at 400 Lincoln Square. Principal Real Estate Group sold the One Twelfth @ Twelfth West Building to Gemini Rosemont for $451.72/sf, totaling $217,000,000. 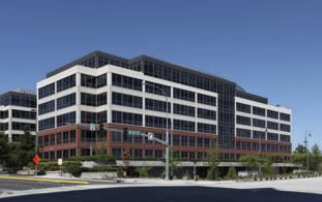 Built in 2001, the 480,389sf property sold with a cap rate of 5.9%.